Show your fandom for your favorite collegiate powerhouse with these playfully embroidered pillows. 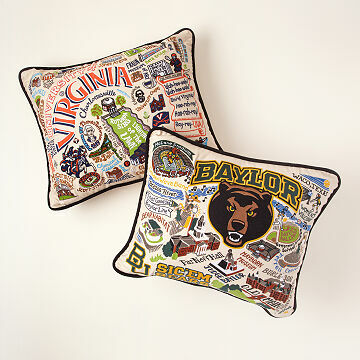 Show your fandom for your favorite collegiate powerhouse with these playfully embroidered pillows. From Auburn to Ole Miss, the colors, mascots, landmarks, and stadiums of each school come to life in a pillow-scape collage worthy of the storied traditions of your school of choice. Whether you root for the Nittany Lions or the Seminoles, you can add these soft accents to your decor, clutch them when it's 4th and goal, or rest your head at halftime. Made in Thailand. Click here to a full list of available Embroidered College Pillows. I can't find anything bad to say about these pillows They arrived quickly and they're gorgeous looking and also feel great. I bought one to see how it looked & felt and now I'm buying 3 more because I love the way they look. Love the uniqueness of this gift for the holiday this year!! Beautiful graduation gift as a quality keepsake. Love these as unique, special, keepsake gifts for college graduation. Only one University of California school was represented, unfortunately. There are many more: UCLA, UCSD, or my daughter's school- University of California Santa Barbara, to name a few. I could buy these as gifts for friends, but not for my own daughter as a graduation gift. This was disappointing. This was a gift for my niece's graduation from college. Awesome gift for a special person for a special birthday .. The university's colors, traditions, schools on the pillow are perfect. Quality item with attention to detail! Did not get to see the pillow in person as it is special order, but the recipient shared the detail is incredible! This is a great little gift idea! The college I chose was West Virginia University. The design is great and all of the embroidered images are very relevant to WVU. A great reminder of our alma mater.